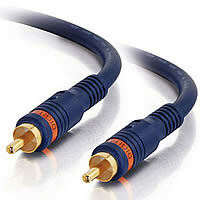 There are 2 Styles of Digital Audio Cables on this Page ranging in price. 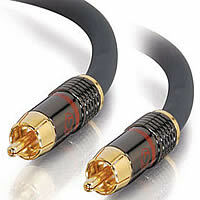 The differences can be found in the shielding which also determines the price of the cable. SonicWave is Triple Shielded, Velocity is a Double Shielded Cable. in the most demanding audio and video installations. S/PDIF coaxial cables can carry linear PCM or multi-channel Dolby AC-3/DTS digital content. SonicWave™ Digital Audio cables feature proper characteristic impedance, fast frequency-independent signal propagation and effective shielding against RFI and EMI. Impact Acoustics SonicWave S/PDIF interconnects use smooth, flawless, large cross-section silver-plated OFC as the signal conductor. A nitrogen-foamed PE insulation exhibits extremely low dielectric constant. Cu Shielding Technology™ provides three layers of shielding: two 80%+ OFC copper braids and one 100% overlapped Mylar® foil. Precision design and manufacturing ensures the characteristic impedance of the cable assembly remains 75 ohms, +/- 5 ohms. This high performance S/PDIF digital cable is also ideal as a world-class composite video cable for especially demanding video applications! Designed to carry the digital audio stream from a CD transport, DVD player, DAT deck or other digital component to an A/V receiver digital input or the input of an outboard D/A converter. Velocity™ Digital Audio Coax Cables are a great upgrade from the cables typically included with consumer electronics products. Low-loss 75ohm oxygen-free copper center conductors and foam dielectric provides improved sound quality and performance. The 100% aluminum foil and dual OFC braid shields protect against unwanted noise and interference. Robustly designed molded connectors combine with an ultra-flexible jacket, and allow for easy installation and identification. The 24K gold plated, durable connectors ensure long-lasting performance.